Beer from All Over The World is a unique gift as it consists of six imported beers from around the globe along with perfectly matched gourmet goodies. They'll go crazy when they find a bottle of Red Stripe from Jamaica, Moosehead from Canada, Old speckled Hen from England, Founders from the USA, Kirin from Japan, and Weihenstephaner from Germany... and also an excellent variety of palatable gourmet foods including Jalapeno Cheese, Chichester Snack Mix, Garlic Sausage, and more. 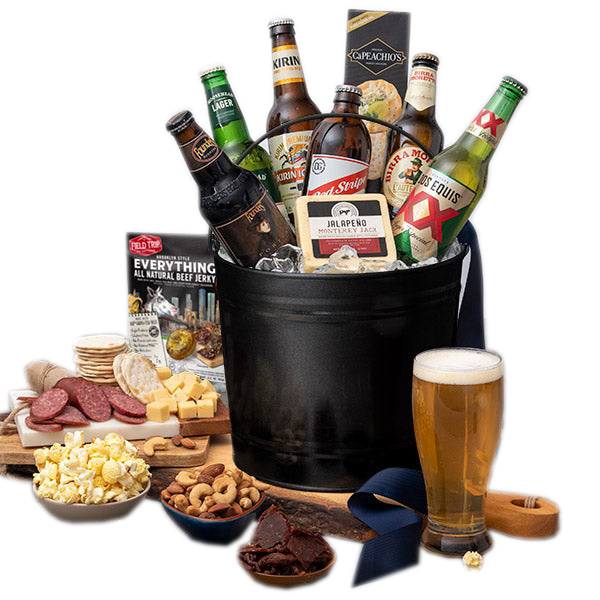 The clever design and great presentation make this Beer Bucket a perfect gift for any holiday!